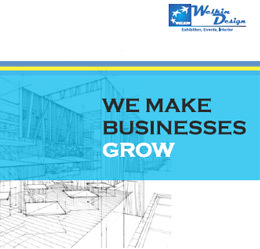 Welkin Design regroups experts with more than 15 years of experience in trade fair stand building. We design and build individual stands as well as a national pavilion with the utmost care to our client wishes. Both global corporations that are leaders in their industries and small and medium size enterprises have already trusted us, thanks to marvelous projects created by the Singaporean and British designers with whom we have established a solid cooperation, our sophisticated and well-made stands will significantly stand out from your competitors. We invite and encourage you to contact us in order to obtain detailed information and any assistance required to implement your unique trade fairs stands. We operate throughout Dubai – Abu Dhabi -Entire Europe and India – offering a turnkey service solution.